He was ‘Mer’ (short for ‘Farmer’). He was ‘Charlie’ (feet splayed out like Charlie Chaplin). He was ‘The Naenae Express’. He is Ewen Chatfield. He retired just last weekend from playing cricket (unconfirmed whether that includes the backyard version). He was/is Naenae’s and Wellington’s finest. He is the man who Javed Miandad wanted to take back to Karachi and use as a bowling machine. At times out in the middle he looked about as supple as a plank of wood, not to mention a forward defensive batting style resembling someone prodding a giant rat with a long stick to try to move it on. He is, and always will be, until the planet gets too damn hot for habitation, an all-time, iconic Kiwi cricket, no, make that all sports, dead-set, blimin’ legend. 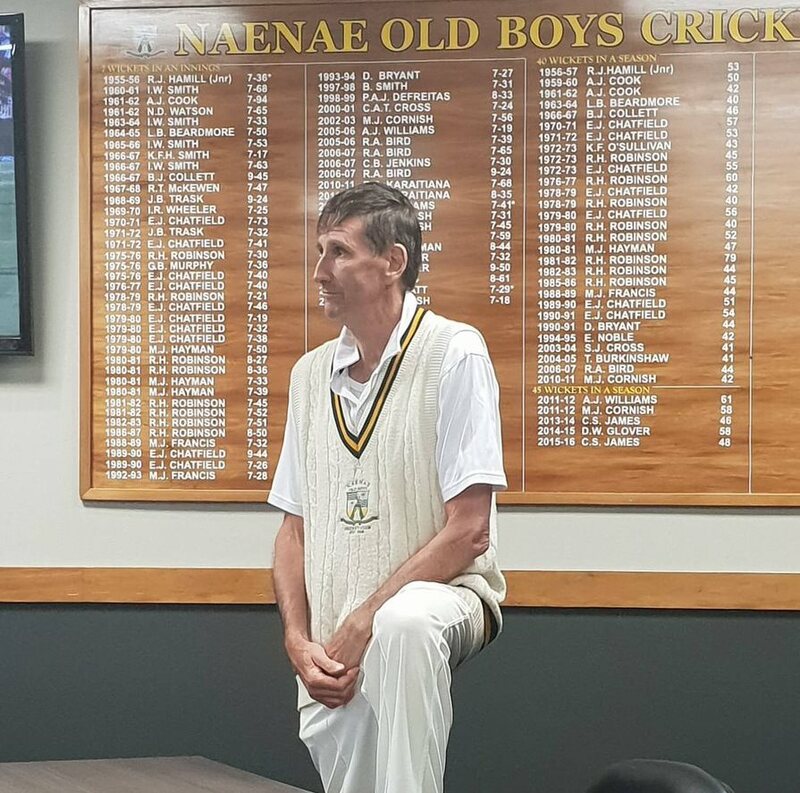 And, get this: The most incredible part of the whole thing, from the photo from retirement day he still looks almost exactly the same as when he finished from test match cricket in 1989. Thing is though, he was born in 1950. Meaning he will turn sixty-nine this year. And he’s only just stopped. Words can hardly describe that longevity on the cricket field. I’ll admit I shed a little tear when I read about his retirement from club cricket. Because Ewen Chatfield is the absolute personification of the great New Zealand sporting hero. He was as much a part of my formative years of loving sport as the All Blacks, the All Whites-‘82 World Cup, the Ranfurly Shield, the FA Cup Final, One-day cricket (the beige years), Arsenal’s 1979-80 season (70 matches, two finals, won nothing), and the Melbourne Cup. Guts, for a start. (He was knocked on the temple, rendered unconscious and almost died after swallowing his tongue, in the middle of Eden Park in 1975. The video of the incident is truly sobering and horrific). But he fought back years later to have a long-lasting international career. A people’s hero- he was never a Sir Richard Hadlee or a Malcolm Marshall with the ability to bowl out a side for around fifty just on his own. But in the latter half of his international career, he was the man who was always a threat to top players when he got the leg-cutter going, or who frustrated his quarry into a rash shot with a frequently unerring line just short of a length on off-stump. (Yawn-inducing cliché alert): He was the yin to Hadlee’s yang. But he was, really. And on the rare occasions when Hadlee wasn’t quite in luck, the accurate Chats was often the one to snare a top-order wicket. His status as an ever-lasting hero of Joe Cricket Public being confirmed with this partnership with the ‘Mantis’, Jeremy Coney on Carisbrook, Dunedin in February 1985 to give NZ a 2-0 series win versus Pakistan, when it looked for all the world like ending 1-1. That moment has surely become his most iconic; fantastic and a pity at the same time because his combined test bowling performances deserve being more than a sidelight. In England’s second innings at Headingley, Leeds in 1983, Chats was to the fore with 5-95, the opposition all out for 252. Included in his tally were the two obdurate openers, Fowler and Tavare, and a middle order spell which yielded three wickets, all caught behind by Ian Smith, to send England into a tailspin at 190-7. It was to be a milestone performance in a milestone match- the first-ever match victory for the Kiwis on English terra firma. They won by 5 wickets. Incidentally, Lance Cairns took seven in the first innings and totalled ten for the match, but this is about Chats, sorry Springers. And another prerequisite for a man of the people- an unassuming nature. There was never the remotest danger of him ever falling victim to the tall poppy syndrome. In the world of bathroom cricket, if the late, great Martin Crowe was Faberge and Brut, then Chats would have been Brylcreem- no frills, traditional, functional. Chats certainly became famous for his poke, prod style of batting as a perennial number eleven in the batting order. He had pretty good stickability many a time though. On the field he seemed to have a strong affinity with the regular wicket keeper through the 1980s, Ian Smith. And on Eden Park in 1984 against England, as Smith was around twenty runs short of a maiden test century, Chats stuck around long enough for him to bring up the three figures. The sheer joy on Smith’s face was brilliant, and he embraced his venerable partner in a big hug for not succumbing. That was special to see. On another occasion, there was a Hadlee-Chatfield benefit game held on Eden Park, after the 1986 Australian tour had finished. (One of the very few occasions that someone- and it’s killing me that I can’t remember who- hit a six onto the South Stand roof). When Chats came out to bat, he was driven to the wicket in the drinks cart by Bruce Edgar, who then proceeded to park the cart at the side of the pitch in readiness for Chats not lasting long. Being right there in the crowd, it was of course highly entertaining. Ewen Chatfield. Bowl, Prod, Legend. (And no small matter of 123 wickets in 43 test matches). And I’ll be running a new ‘Swinehound’ quiz soon- if you have an interesting, curly quiz question please email it to me, and I will certainly try to include it in the next edition of the ‘hound, or in the future. Will acknowledge your name next to your quiz Q also. Only thing is, you are of course then precluded from entering!